South Africa vs Pakistan: Veteran South African batsman Hashim Amla broke Virat Kohli’s record as he became fastest to reach the milestone of 27 ODI hundreds. 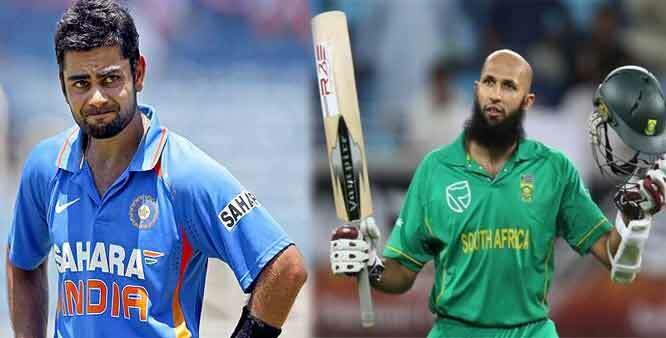 Veteran South African batsman Hashim Amla on Saturday broke Indian captain Virat Kohli’s record to become the fastest to reach the milestone of 27 ODI centuries. Amla slammed 108 runs off 120 deliveries in the first ODI against Pakistan at St George’s Park in Porth Elizabeth. However, his efforts went in vain as Pakistan won the game by five wickets. Amla steadily paced his innings and played cautiously throughout his 108-run knock to overhaul Kohli’s record. It took Amla 167 innings to score 27th ODI hundred while Kohli had achieved the milestone in his 169th innings in the first ODI against England on 15 January 2017 in Pune. Amla took a couple of innings fewer than Kohli to own the record. One of the most consistent batsmen of the modern era, Amla has been a mainstay in South Africa’s batting line-up for years now. He was not at his finest against Sarfraz Ahmed & Co in the first ODI but managed to score another century to help his side post a challenging total. Amla’s 108-run knock was laced with seven boundaries and a six. Batting first South Africa managed to post 266/2 on the board in fifty overs with the help of Amla’s 108 and Rassie van der Dussen’s 93 off 101 deliveries. Hasan Ali and Shadab Khan picked up a wicket apiece for Pakistan. In reply, Pakistan chased down the target with five balls to spare. Pakistan got off to a strong start as openers Imam-ul-Haq (86) and Fakhar Zaman (25) posted a 45-run stand for the opening wicket. Babar Azam (49) then combined with Mohammad Hafeez (71) to sail Pakistan through. Duanne Olivier was the pick of the bowlers for the hosts with two wickets under his belt. With the 5-wicket win, Pakistan took a 1-0 lead in the five-match ODI series.